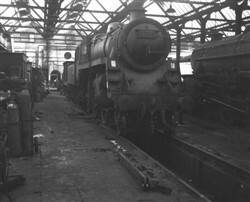 The last steam engine to leave Bletchley Loco shed on July 5th 1965 (Accession Ref: RWS/P/142.). History is not just about events. It’s about people, their experiences, their triumphs, the way they live their lives and how they tell their stories. ‘Where the Lines Meet’ is a collection of still images, documents, and 43 oral history audio recordings collecting the memories of people who have worked on, or used the railway at Bletchley. 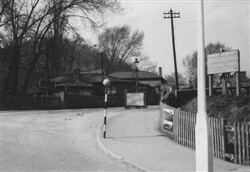 The project was funded by the Local Heritage Initiative in conjunction with Living Archive, Milton Keynes, to document the Railway Heritage of Bletchley. 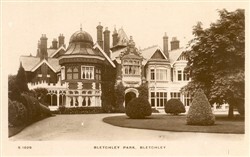 The railway has been an important part of the growth of Bletchley throughout 170 years. 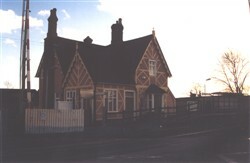 Many people moved here, worked here, and generations of families have been involved with the railway in some form or other. 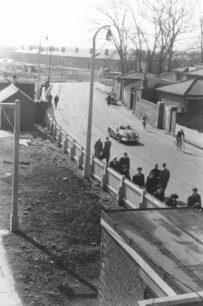 The information for this project was gathered by local people using local resources and materials provided by Bletchley Community Heritage Initiative and Living Archive. Oral history audio recording of Robin Brown (b.1931). 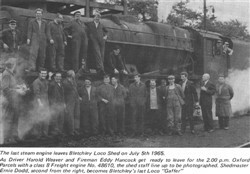 Interview about Mr Brown’s career as a Bletchley railwayman, in particular life as an engine driver; including comments on working conditions and anecdotes about fellow workers and passengers. Oral history audio recording of a male resident (b.1960). Interview about steam engines, and local and national railway travel. Oral history audio recording of Bill Bassett (b.1928). 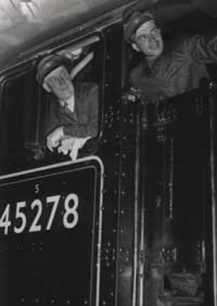 Interview with a long-serving railwayman about his career on the railways from 1942 to 1991, including life as a call boy, fireman, engine driver and train crew Manager. Topics include working conditions, dangers, accidents, and driving the Royal Train. Oral history audio recording of Bill Tew (b.1917). Interview with a long-serving railwayman about his careeer on the railways from 1935 to 1982, including life as an engine cleaner, fireman and engine driver. Topics include working conditions, dangers, accidents, the Beeching cuts and the Royal Train. Oral history audio recording of a male resident (b. 1925). Interview with a long-serving railwayman, topics including career progression, working as an instructor, Bletchley station, the Beeching cuts, the Royal Train and changes to the railways. Oral history audio recording of a male resident (b.1940). Interview with a long-serving railwayman; topics include Wolverton Works apprenticeship, technical details of trains and tracks, Bletchley station, the effect of the Beeching cuts and other changes, and the Royal Train. Interview with a resident of Fenny Stratford and Bletchley since 1940; topics include his memories of Bletchley Station and its staff, local shopkeepers and companies who used the railways for freight. Oral history audio recording of Eric Redford (b.1924). Interview with a Woburn Sands resident and brickworks employee about his memories of local railways from the 1940s onwards. 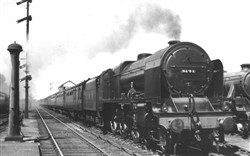 Topics include his memories of Woburn Sands, railwayfreight in wartime and changes to the railway system. Oral history audio recording of a male resident (b.1927). 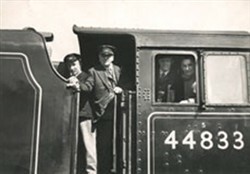 Interview with an ex-train driver who joined the railways in the 1940s, and left in the 1950s. Topics include driving, Bletchley station and social life in Bletchley. Oral history audio recording of Ron Sear. Interview with a long-serving railwayman about his career from 1945 to 1996. 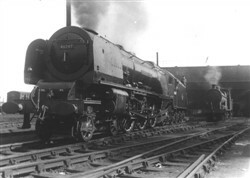 Topics include the ‘Fogman’, life as an engine driver, including driving the Royal Train, Bletchley engine shed, working conditions and shift work. Oral history audio recording of Eric Hickford (b. 1924). 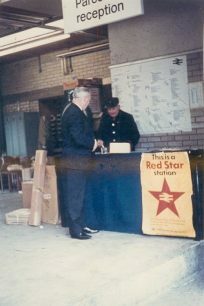 Interview with a railwayman whose career was based in various parcels offices. Oral history audio recording of a male resident (b.1917). Interview with an engine driver who worked in London and Bletchley. Topics include the Royal Train, Bletchley Town football club and his childhood in London. Oral history audio recording of a male resident (b.1925). Interview with a long-serving railwayman, about his roles as porter, train reporter in the telegraph office, and in the workshop as cleaner, examiner and electrical maintenance. Oral history audio recording of a female resident (b.1927). An interview about life in Bletchley since the 1940s. Topics include study at Wolverton Grammar school, evacuees, Bletchley Park staff, social life and shopping, and changes to Bletchley in the 1950s. Oral history audio recording of a male resident. Interview with a Bletchley resident who worked in the Railway Signals Department for a period. Topics also include memories of Far Bletchley and it residents. Oral history audio recording of William Boyes (b.1927). 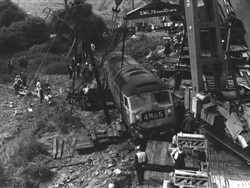 Interview with a railwayman who was employed as a member of a gang working on the tracks between Bedford and Bletchley from 1957; includes comparisons of working conditions then and now. Oral history audio recording of John Alan Cox (b.1932 ). Interview with a long-serving railwayman about his career on the railways from 1949 as a cleaner,fireman and engine driver. Topics include descriptions of jobs, working conditions, training and comparison of diesel and steam engines. Oral history audio recording of Merlin Figg (b.1941). Interview with a railway fitter and electrician. Topics covered include apprenticeship from 1956, diagnosing problems with engines, working on the Breakdown Gang, and the effect of privatisation. Oral history audio recording of Charlie Wyn-de-Bank (b.1957). 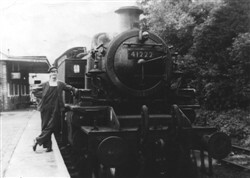 Interview with a ‘second man’ who worked for five years on the railway in the 1970s. Topics include his memories of Bletchley station as a child, the ‘second man’ and engine driver roles, railway safety and the Railway Club. Oral history audio recording of Jean Cooper. An interview about attending events at the Bletchley Railway Club as a family. Oral history audio recording of Gerald Dodds (b.1931). Interview with a railwayman who began his apprenticeship in 1948. Topics include post-war accommodation for railway workers; apprenticeships, safety and dealing with incidents; social activities; Bletchley Station buildings and their redevelopment; the change to diesel and electric; the British Transport Pension Federation. Oral history audio recording of Joan Ryan. A brief interview about Bletchley station, the Bletchley to Bedford line and ‘Newport Nobby’. Oral history recording of Betty Watts (b.1920). Interview with an instructor at the Bletchley Park Post Office Training School recalling memories of Bletchley in the 1940s and 1950s. Oral history audio recording of Sylvia Chase (b.1930). Interview about memories of Bletchley Station from 1966 onwards, and use of the railway. 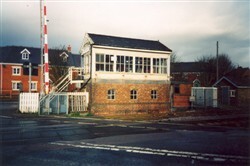 Topics include the station buildings and places to shop. Group: Oral history audio recording of Robin Brown (b.1931). Group: Oral history audio recording of a male resident (b.1960). Group: Oral history audio recording of Bill Bassett (b.1928). Group: Oral history audio recording of Bill Tew (b.1917). Group: Oral history audio recording of a male resident (b. 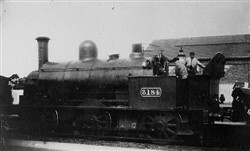 1925). Group: Oral history audio recording of a male resident (b.1940). Group: Oral history audio recording of Eric Redford (b.1924). Group: Oral history audio recording of a male resident (b.1927). Group: Oral history audio recording of Ron Sear. Group: Oral history audio recording of Eric Hickford (b. 1924). Group: Oral history audio recording of a male resident (b.1917). Group: Oral history audio recording of a male resident (b.1925). Group: Oral history audio recording of a female resident (b.1927). Group: Oral history audio recording of a male resident. Group: Oral history audio recording of William Boyes (b.1927). Group: Oral history audio recording of John Alan Cox (b.1932 ). Group: Oral history audio recording of Merlin Figg (b.1941). Group: Oral history audio recording of Charlie Wyn-de-Bank (b.1957). Group: Oral history audio recording of Jean Cooper. Group: Oral history audio recording of Gerald Dodds (b.1931). Group: Oral history audio recording of Joan Ryan. Group: Oral history recording of Betty Watts (b.1920). Group: Oral history audio recording of Sylvia Chase (b.1930). Group: Oral history audio recording of John Parsons (b.1939). Group: Oral history audio recording of Marion Haines. Group: Oral history audio recording of Margaret Goy (b.1941). Group: Oral history audio recording of Sybil Wright. Group: Oral history audio recording of Monica Austin (b.1935). Group: Oral history audio recording of Pamela Essam (b.1938). Group: Oral history audio recording of Wendy Cook (b.1932). Group: Oral history audio recording of Pauline Redhead (b.1940). Group: Oral history audio recording of Dorothy Hendry (b.1934). Group: Oral history audio recording of Malcolm Ravensdale (b.1950). Group: Oral history audio recording of a male resident (b.1948). Group: Oral history audio recording of Syd Seymour (b.1931). Group: Oral history audio recording of Agnes Seymour (b.1935). Group: Oral history audio recording of David Hillier. Group: Oral history audio recording of Bob Merivale (b.1947). Group: Oral history audio recording of Mr and Mrs Gerald and Betty Dodds (Mrs Dodds b.1935). Group: Oral history audio recording of David Gommon. Group: Oral history audio recording of Dennis Lovett (b.1953). Group: Oral history audio recording of John Wilde (b.1931).